Builder: Hunzinger Construction et al. Viewpoint Tickets - Best prices on Brewers tickets, Braves tickets, MLB tickets and MLB All Star tickets. Location: 201 South 46th Street. Left field (E), Menomonee River and South 44th Street, later US-41 Stadium Freeway; third base (N), Story Parkway and Interstate 94; first base (W), General Mitchell Boulevard; right field (S), West National Avenue and the National Soldiers Home. Dimensions: Left field: 320 (1953), 315 (1975); power alleys: 355 (1953), 362 (1962); deep alleys: 397 (1953), 392 (1955); center field: 404 (1953), 410 (1954), 402 (1955); right field: 320 (1953), 315.37 (1954); backstop: 60. Fences: Left field: 4 (1953), 8 (1955), 8.33 (1959), 10 (1985); center field: 4 (1953), 8 (1955), 8.33 (1959), 10 (1985); right field: 4 (1953), 10 (1955). 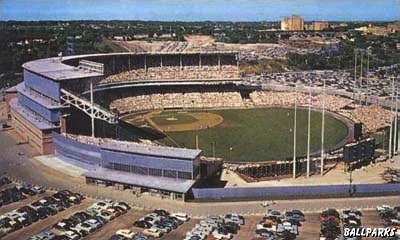 With its dull gray exterior, cramped concourses and obstructed-view seats, Milwaukee County Stadium was an old park without an old park�s character. It opened on April 6, 1953, for an exhibition game between the Milwaukee Braves and the Boston Red Sox. It held only 36,011 fans at the time, and only 28,111 of them sat in permanent seats. That changed after only one year, and the bleacher configuration and size changed several times afterwards. In 1982, those bleachers were filled for the stadium�s first World Series in 25 years when the Brewers hosted the Cardinals. The Braves hosted the Yankees here in both the 1957 and 1958 World Series. In 1994, the National Football League�s Green Bay Packers announced that they were leaving the stadium, where they had played two or three regular-season games each year since 1953. The Brewers moved into a new retractable roof stadium in April 2001. It was constructed in what was then the center field parking lot. The last Brewers game was played in County Stadium on September 28, 2000. The last time the Braves played at the ballpark was May 25, 2000. 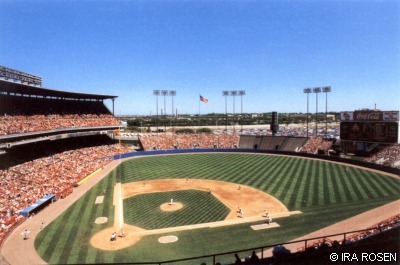 The All-Star game was hosted here by Brewers in 1975 and by the Braves 1955. Stadium sat on site of former Story Quarry. Surveyor�s mark on right-field foul pole: "315.37." From 1953 to 1973 (before the park was expanded) hospital patients at the National Soldiers Home V.A. Hospital sat outside their rooms on Mockingbird Hill overlooking right field and watched the games for free. Perini�s Woods, a grove of spruce and fir trees behind the center-field fence, were planted in 1954 and replaced by bleachers in 1961. Braves Reservation, a picnic area down the left-field line, was inaugurated in 1961. Bernie Brewer would slide into a huge beer stein in right-center whenever a Brewer hits a homer. Cecil Fielder was the only player ever to hit a homer completely out of the park during a game. Scene of Midwest League minor league game on August 27, 1966, between Fox Cities and Wisconsin Rapids. Braves hosted both the Cincinnati Reds and the St. Louis Cardinals on September 24, 1954. The first game was the continuation of a game played two days earlier, the conclusion of which on a disputed double play was successfully protested by the Reds. The Reds tied the game after the protested contest�s resumption, but the Braves won, 4-3, in the bottom of the ninth, and then went on to beat the Cardinals, 4-2. 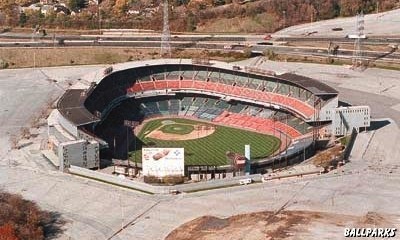 The Chicago White Sox played here for nine games in 1968 and 11 games in 1969. One could find bratwurst being cooked all around the parking lots at baseball�s biggest site for tailgate parties. This is still the case with Miller Park, the Brewers' current home. Helfaer Field, a Little League ballpark, occupies part of the site where County Stadium once stood. View inside County Stadium © 1999 by Ira Rosen. Aerial view (1997) of County Stadium courtesy of the Milwaukee Brewers. Aerial view (1950s) of County Stadium courtesy of Mark Stearn. Special thanks to Jeff Bergs for his contribution to this page. Tickets to Atlanta Braves, Milwaukee Brewers, NCAA Basketball Tournament, College Football Bowl, NCAA Football and Paul McCartney provided by Ticket Triangle.